We had been there three years ago, and thoroughly enjoyed ourselves. This time was no exception. The location, with the view and the sound of the sea on the rocks, is idyllic. There were four of us two Irish, one American and one English - two with special birthdays. When confirming the booking I mentioned the birthdays and asked if they could make our first dinner night special. The staff certainly did. They hoodwinked my friends by asking the guys on the table next to us to sing happy birthday, and my friends thought someone else is celebrating a birthday. Until the waitresses came over with our deserts and a lit candle in two of them!!! I highly recommend the Smugglers Inn for so many reasons, the location, the friendly obliging staff and the delicious meals. So glad we booked the large room with the closed in sitting area as we had awesome views of the coast line and sunsets! Weather just happened to be fantastic for golf and exploring the sandy beach. Dinner and breakfast at the inn were very good. Also lunched at the golf club house and second dinner in town. A 15 minute walk down road into town not bad a good stretch of the legs. Really there to relax and enjoy the view. Staff very accommodating and friendly. Room and bath very large. Nice quiet evenings. 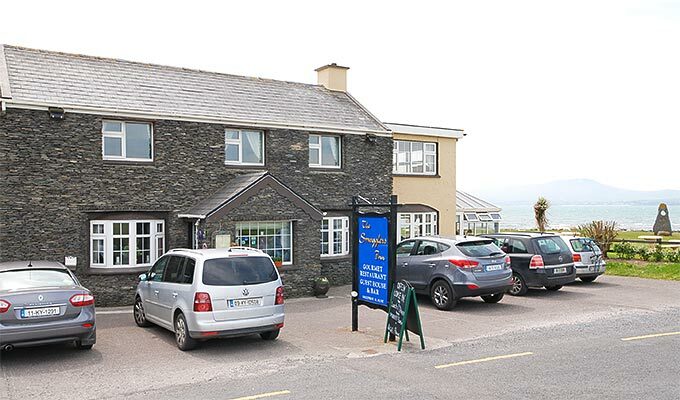 Superb location overlooking Ballinskelligs Bay. Comfortable accommodation. Excellent food. We had a wonderful stay in Smugglers Inn and enjoyed it very much. The dinner was just perfect, Staff is so friendly, we will be back for sure. This is a truly wonderful place to stay. I have stayed before more recently last month and will definitely be returning. The staff, service, food and overall welcoming atmosphere is a joy to experience. A big thanks to Lucille, Anna, Sarah, Sue and the rest of the staff for giving us another memorable weekend. Position good.... Restaurant : VERY GOOD!!! Very good meal and breakfast, but the mattress are too soft, you can resent resorts. No water pressure in the shower neither. Service is good, the view wonderful, the beach just in front. Comfortable, traditional accommodation in a beautiful position, and with good food, and welcoming staff. We enjoyed our stay. We had a wonderful stay at The Smuggler's Inn. The view was outstanding, the people were wonderful, and the food was outstanding! I would definitely stay there again if I ever make it back to Ireland. Beautiful location and great food. The staff is by far the best reason for staying at the Smuggler's Inn. This B&B has a very "homey" feel. We thoroughly enjoyed our stay there although too short I would have loved to have a few more meals there. Price was perfect, too! Great location combined with very good accommodations and a fantastic restaurant. I didn't play golf at Waterville, but proximity to the course was excellent. The best meal We've ever had!! The fried prawns were gorgeous and the monk fish was delicious and the bisque was amazing!! Staff were very friendly Fiona was hilarious and the view from our room was beautiful and beds were comfy with lovely linens. Would highly recommend this place and would love to go back!! The location of the hotel is fabulous and the staff friendly and helpful. Unfortunately the beds were not so comfortable and there was a smell of dampness in the room and the bathroom. We paid €50 B&B pps and per night in a room for 3 which was very overpriced. Same applies to the restaurant which serves nice food with a wonderful view but very overpriced. I would go back to have a drink facing the ocean but I would stay in a local B&B! How do I describe my stay at one of Ireland's jewels The warmth and welcome of the staff, made me feel at home, the food, outstanding, Derek and his staff, create culinary delights!!! The setting on the edge of the Atlantic, gorgeous!!!! This the first and only place I choose in the lovely town of Waterville. I have my days counted until I return, I left a piece of my heart there!!! Returning to The Smugglers Inn this week for my 16th stay. That probably says enough in itself. I've travelled all over the world and stayed in the fanciest of hotels. However its hard to beat the heart this place has. An incredible setting and always a warm welcome assured. Its as much the people that make it special, along with Henry's cracking cooking and a comfy bed. And if that's not enough the just happens to be a world class golf course 2 minutes walk from the door. Check it out for yourself. Giugno 2012 - Mio marito ed io abbiamo soggiornato due notti in questo hotel trovato per caso e per fortuna alla fine di una splendida giornata in giro per l'Irlanda. Le vedute, sia dalla calda stanza che dalla veranda - ristorante sono superlative. C'è solitudine, silenzio, grandiosità di paesaggio, una lunghissima spiaggia che invita a camminate serali dopo cena. Accoglienza e cibo ottimi, detto da italiani esigenti in fatto di arte culinaria. Gentilissima signora alla reception ha curato la prenotazione dell'escursione all'Isola Skelling, che pero' non è andata a buon fine a causa del maltempo. Ci torneremo appositamente per rifare questa imperdibile escursione. Just home from my stay in The Smugglers Inn, i never really write reviews but i said i would this time as i had such a good time. The staff could not be more helpful, accommodating us when we arrived late due to car problems. They have a nice bar area with lovely Guinness and a dining room looking out over an amazing view. I would without hesitation recommend The Smugglers Inn to anyone. You will be guaranteed a good stay, a comfy bed, smiling staff and to top all that be served delicious food. We are just home after a most wonderful stay. The Staff are exceptionally helpful and welcoming too many to mention individually and seem so happy to work there. The Food both for breakfast and Dinner surpassed any meals we have had and we do travel a lot. Compliments to Henry the Chef and Prop. and we will be back for sure. This is the ideal base for touring Kerry. Bernie. Limerick. I can hardly express in just a short paragraph how wonderful our experience was at the Smugglers Inn. First off, we got in extremely late. Being foreign, we had no concept of driving time and arrived just as the restaurant was closing. We felt horrible but were greeted with such warmth. After our unexpectedly long drive, we were hungry and ready for a yummy meal. We got way more than a yummy meal. My mom's oysters were the best she had ever had. My pasta was freshly made in house and was perfectly done. My son so enjoyed his meal, although I can't remember what he had. By the time we wrapped up our meal, it was dark. We had a restful sleep and dreamt of the view we would see the next morning. Which was beyond spectacular! Coming from FL, we were excited to walk on an Irish beach : Thank you again to the owners, staff, and chef for making our vacation a huge success! We had a great time at the Smugglers Inn. The service and the food were excellent. Thanks Henry for the good enjoyments which we were allowed to try during our stay. We will come again. Cannot review as we didn't stay when we saw the room.